THERE’S NOTHING LIKE MAKING a good first impression, and from the moment I got my mitts on the Beuchat X-trem Semi-dry I was impressed. It looked and felt the business. Heavyweight 6.5mm neoprene, neoprene neck-seal, internal wrist- and ankle-seals, T-zip across the top of the chest, good build quality and all black – if this suit were a movie actor, it would be Jason Statham. Gets the job done, my son, and none too subtle about it. What’s not to like? Look closely, and the construction of the suit is impressive too. All the external seams are neatly finished with the stitching carefully glued over, and the interior seams are smooth against the skin, with small reinforcing patches at areas of high stress such as where panels meet at corners. This is where the seams are most likely to start to give, some time down the line. Then I had to try it on. Of course I did. The T-handled zip runs from armpit to armpit across the top of the chest. A tube of zip-lube comes with the suit, so I lubed the zip and pulled it open and shut once or twice. It moved with a feeling of smooth precision. 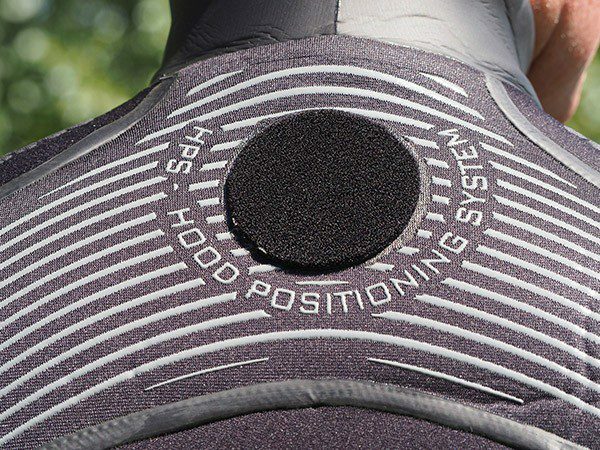 Hood-positioning system and outer seams. Zip open, you step into the legs of the suit, leaving the arms, top of the body and neck-seal flopping behind you while you shove your feet through the ankle-seals and settle the legs, bum and torso nicely in place. Next you reach back and get your arms in the sleeves, and finally reach up and over the top of your head – like doing shutdowns on a twin-set –get hold of the upper body section and lift it up and over, pushing your head through the neoprene neck-seal. Lastly you do up the zip. It’s quite possible to close the zip by yourself, but you may find that a length of string temporarily looped around the T-handle makes it easier to pull the last bit across. The whole process is simpler to do than to explain, but don’t expect the X-Trem to be as easy to get into as a stretchy warmwater 5mm. This is a semi-dry, intended to keep as much water out as possible, and a little bit of work to get it on will be rewarded with a warmer, drier dive. Take the time to properly settle the seals found in the legs and arms smoothly in place as well, which means pulling the legs up or pushing your arms down until it’s all in place, and no going to and fro until you’re comfy. You’ll soon get the knack. Once on, flexibility is excellent. I had wondered if the front zip would be a little stiff or constricting, and I was aware of it both above and under water, but it never felt as if it was in the way or preventing me moving smoothly and comfortably. Experience suggests that the thicker your suit, the less mobility you’ll have, but not with this one. Beuchat has used different grades and types of neoprene to make it flex where it needs to, and the result is a suit that’s nice and comfortable out of the water. Staying in place is a feature of this suit. Texturing on the rump means that your backside is more likely to stick to the tubes of the RIB when the sea is less than perfectly calm. Which it usually is. A small patch of furry Velcro sits on the outside of each wrist, and Beuchat provides a similar patch of hooky Velcro for you to attach to the bottom of your dive-computer. This is to stop your computer wandering around your wrist. There is also a patch of Velcro on the back of the suit, just below the nape of your neck, and the supplied hood has Velcro at the back. The intention is that the hood sits tight to the suit and the skirt doesn’t roll up like one of those collars your dog wears after a visit to the vet. This hood is excellent. It’s made of a stretchy neoprene that pulls on nicely and sits firmly in place. The facial aperture is a good size, the skirts of various masks I tried were easily accommodated, and when I put a reg in I didn’t feel any constriction around my jaw. Gas vented from a regulator can find its way into your hood and threaten to lift it off your head, so the Beuchat has a series of vents in the top to allow air to escape, which works well. I pulled the sides of the hood away from my cheeks and deliberately filled it with air, to the amusement of my buddy, who described the subsequent minute or two as like watching the top of a can of pop when you’ve given it a good shake before cracking the ring-pull. Normally, of course, it just does the job unobtrusively. Green glow-in-the-dark and presumably reflective ribs adorn the top of the hood to make you easier to see in the water, and you can also use the Velcro patch to attach it to the keeper area of Velcro just beneath the smallish but usable pocket on the right thigh. Time to take the X-Trem diving, and slipping into my BC or bending to put on dive-boots or fins was equally straightforward. A stride entry, and there was no immediate sensation of water penetrating the suit. The feeling was more akin to dropping into water wearing a drysuit than a wetsuit. 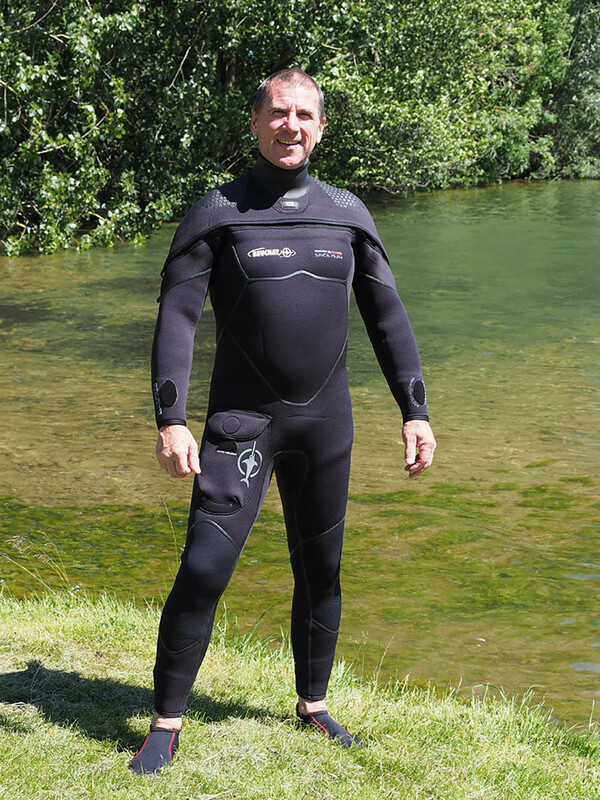 The thermal challenge I posed the suit wasn’t great – the water at Ellerton was 18°C – but I was nice and warm for more than an hour with nowt under the suit but me and a pair of swim-shorts. The only niggle I had was the zip running across my chest, which felt cold against my bare skin, as though water were trickling through. It was just the teeth transmitting the temperature of the lake with no neoprene in the way to absorb it. I’d be tempted to wear a rash vest under this suit purely to stop the distraction. In the event, very little water got into the suit. My swim-shorts were damp when I climbed out of it, but that was all, and I think most of that water had gone down my neck when I was messing with the hood, because subsequent dives ended with me being even drier, though never fully dry, as you’d expect. All in all, this is an extremely well made, comfortable suit that does the job. I liked it a lot.